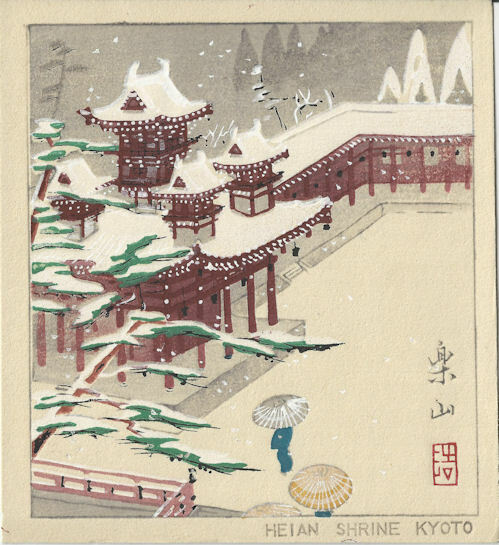 The woodblock print of "WC5" was modeled on an original painting on paper (about two or three times larger) whose current location is unknown. The designation "WC5" is tentative since the order of publication the undated winter cards is conjectural and therefore is subject to change with additional information. 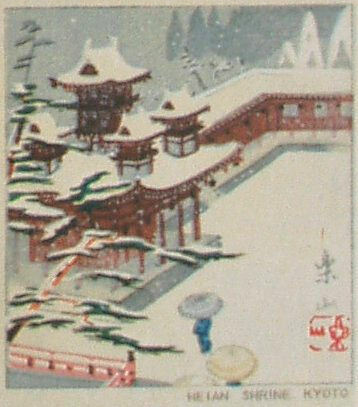 "WC5" is without doubt the best known of the Rakusan winter card prints because of its publication in the Foster booklet (Foster n.d. p.3). 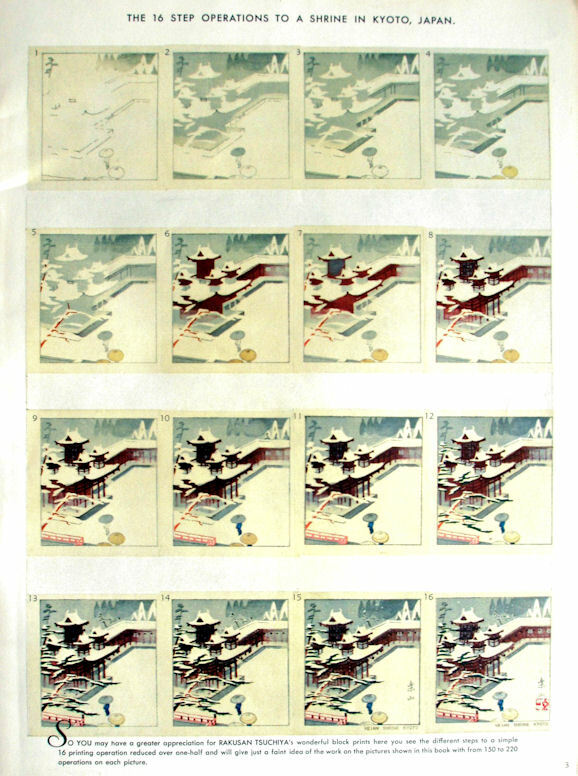 Rakusan created a process set of at least sixteen sheets, each one showing a successive stage in the series of woodblock impressions used to print "WC5". Foster included what may be the complete process set in order to demonstrate the technique of woodblock printing to persons unfamiliar with the complexity and difficulty of woodblock print production. All currently documented individual copies of "WC5" have edition I markings, including all of the uncirculated copies in Rakusan's personal collection. "WC5" was reprinted and sold or given away in large numbers after World War II, and all known copies look very much alike. Edition II is so far only documented by the booklet illustrations of the Foster process set whose present location and status are unknown. This distribution of copies suggests that the "WC5" process set was among the very last pieces produced before the studio closed and that it was produced as a separate project. All copies of "WC5" were printed using the same wooden blocks and therefore are the same size and have the same details. However, the edition II example above is an enlargement of the final process set sheet shown in the lower right corner of page 3 of the Foster booklet. The unfortunately low resolution of the booklet illustrations has already obscured many of the details of the original design. As a result, it is impossible to show the edition II example at the same scale used for edition I. Making color comparisons between the editions is also risky since none of the Foster booklet reproductions are faithful to the colors of their original woodblock prints. "WC5" shows the southwest corner of the main Heian Jingu building. Snow is falling and has covered the trees, roofs, and grounds. Three women in kimonos and carrying umbrellas are walking up the low stairs and to the left. The composition of "WC5" is very similar to that of the upper left corner of the much larger LK1-14 painting, and both designs retain the same viewpoint from above the rooftop of the front gate building. Edition I: Doshisha Archives Center, Doshisha University, Kyoto, Japan; [not illustrated online]. The Heian Shrine (or Heian Jingu), 平安神宮, Heian Jinguu, is a famous, top-ranked Shinto shrine in northeastern Kyoto. It is listed as an important cultural property of Japan. Heian Jingu was built in 1895 as a 5/8 scale partial reproduction of the Heian Palace from Heian-kyou. It was built for an exhibition to commemorate the 1100th anniversary of the founding of the city of Heian-kyou (which later was renamed Kyoto), and afterward was dedicated as a shrine. Nine of the shrine buildings burned in 1976 but were rebuilt by 1979. Heian Jingu also appears in four other Rakusan paintings, but its only occurrence as a woodblock print is "WC5". Four of the five designs (including "WC5") include the same southwest section called 白虎楼, Byakkorou, lit. 'white-tiger watchtower', which is attached to the central building by covered corridor galleries.